It turns out that Luke’s ‘bird’ drawing and our competition launch last week was a massive hit with you guys! Spurred on by the positive response we received, we have decided to extend the competition deadline. Luke has also been encouraged to keep sketching. Another of his ‘bird’ drawings is featured in this post! To give everyone enough time to enter, we are excepting entries until Monday 26/10/2015. Here’s a recap of the DEADLY Prizes up for grabs! 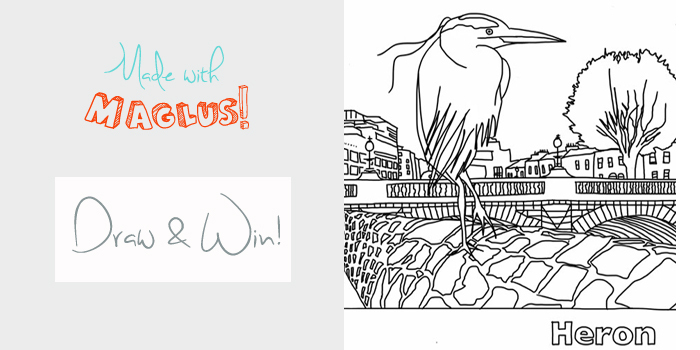 WIN a Complete Maglus Kit: Any Maglus Stylus, Notebook with Graphite Tip & a Brush Tip. There are also TWO Runner up prizes of a Maglus Stylus up for grabs! All you need to do is send us a drawing of a BIRD. It’s that easy! It’s been really fun so far getting to see the variety of birds out there. It reminds us that our product has managed to reach so many diverse parts of the world. It’s pretty cool to think that the Maglus is in countries that we’ve never even visited! Get your home town on the Maglus map and submit a sketch. There’s no restrictions, guidelines or rules. We only ask that you HAVE FUN creating something! The winner of our Mini Maglus is…..Erika Leeon! Congrats Erika and thanks to everyone who entered. Paula studied Furniture Design at DIT in Dublin. She uses the Maglus for quick sketches and notes. She loves tea, coffee and yoga(but not at the same time). Love your stylus! Keep up the great work! The emu is found in Australia! The emu is most commonly found in the Commonwealth of Australia. The ‘Emu’ is most commonly found in…AUSTRALIA! The emu is the second-largest living bird in the world by height, after its relative, the ostrich. It is endemic to Australia.